Wordpress site for a hotel in Switzerland using an integrated Wordpress booking system that allows them to take bookings for specific individual rooms. Also features a Supersized full screen jQuery background image rotator with controls. A WordPress site with a custom theme designed to the client’s specifications. The main feature in this case has to be the bookings system. The hotel, in La Tzoumaz, Switzerland, has 4 individual and unique rooms so the booking system is set to take bookings and display availability on each individual room. Users can flick through the AJAX calendar widget to view available dates, then block them out and submit a booking via the integrated form. The admin is notified by email and the booking request comes through the WordPress backend, is highlighted in the ‘Right Here’ section of the Dashboard, and can be reviewed and modified. If it’s acceptable the admin confirms it, the user is notified by email and the dates are blocked out on the front end (prior to approval they are marked as ‘Pending’). 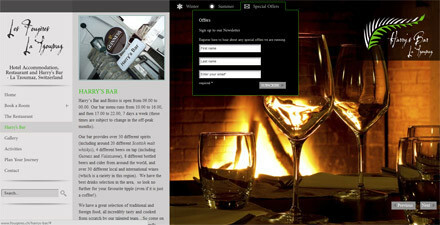 The staff can also quickly add a booking via the backend for guests booking through traditional channels.